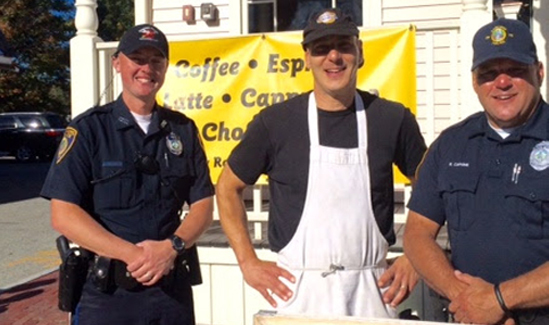 Officer Ron Holsinger (left) and Officer Robert Capone (right) stand outside of Reasons to be Cheerful with owner, Wade Rubinstein (center) who donated free scoops of ice cream to the Concord Police Department’s Good Behavior Citation program. CONCORD — Chief Joseph O’Connor and the Concord Police Department are pleased to announce they have begun issuing citations for good behavior as a way to connect with the community in a positive way. Officers Ron Holsinger and Robert Capone brought the idea forward and, along with other officers, will be issuing “citations” for good behavior to up to 200 people. 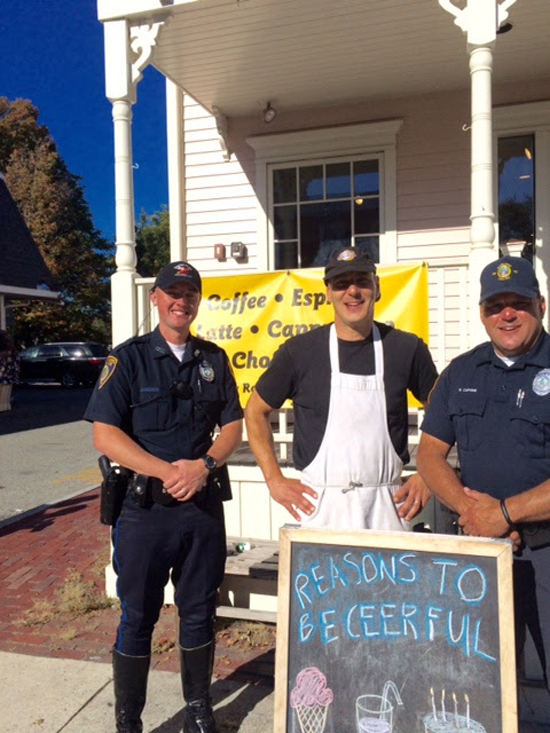 Through a donation from Wade Rubinstein, owner Reasons to be Cheerful, a dessert cafe in Concord, recipients of these citations will be entitled to two scoops of ice cream from the cafe, located at 110 Commonwealth Ave. in West Concord. Some examples of good behavior will include: wearing bicycle helmets, holding a parent’s hand while crossing the street, wearing a seat belt, yielding to pedestrians in a crosswalk, looking both ways before crossing the street, crossing at a crosswalk with the light, and much more. All the police need to do to connect with the community is…TREATS IT’S CITIZENS WITH RESPECT!! There’s no need for ice-cream and other tokens, it just seems to be another reason for the police to initiate a stop with a citizen….a needless one. Citizens get treated with all of the respect that they allow me to give them. If someone wants to behave like a jerk I’ll be happy to give him the respect deserved: ZERO. The citizen is in complete control of how officers treat them. Your attitude is precisely why LE has the some of the problems that it has today. If I understand things correctly, you’re are the professional. You are supposed to be trained to handle situations where a citizen might object to being stopped by an officer. You are supposed to be trained to be able to deescalate tense situations with a citizen. Fortunately, I’ve never had a bad experience related to a police stop, but I do know that many officers show a casual disregard to the public that they interact. In MD, one police chief actually referred to the public as sheep. I resent that and I certainly hope LE get’s their act together. We need a professional force that can be trusted.